Bang Pa-In Palace isn’t what you might expect from a Thai royal residence. Some of the European-influenced architecture wouldn’t look out of place at a stately home in France or Germany. And the sight of tourists driving golf buggies over a bridge lined with Renaissance-style statues may make you do a double-take. But the golf buggies provide a practical and modern solution that allows visitors to explore the expansive grounds in comfort. This may be a royal palace with rules of etiquette, but it retains a relaxed atmosphere and is a pleasure to visit. 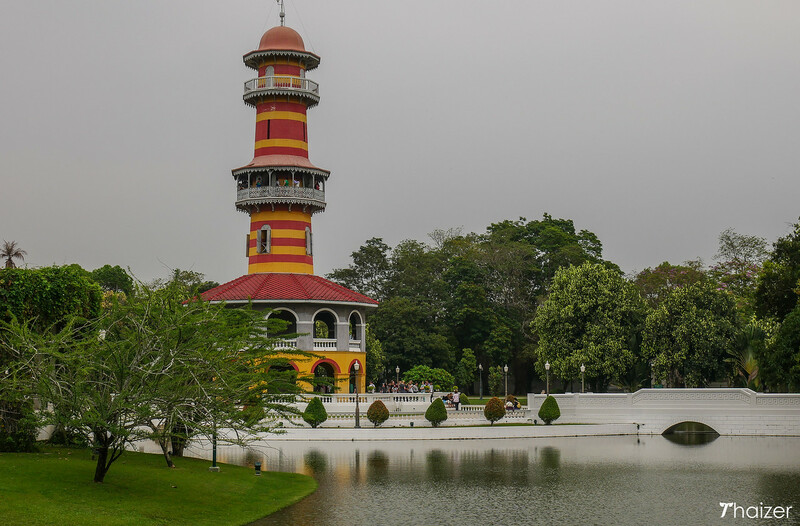 Home to an elegant collection of buildings with a mix of European and Thai architecture styles, Bang Pa-In Palace reflects the personality of the man who oversaw much of the construction, King Chulalongkorn. The history of Bang Pa-In dates back to the 17th century when King Prasat Thong built a palace here. Historians don’t know whether the palace was still in use when Ayutthaya fell in 1767, but contemporary records from the early 1800s reveal the site had been abandoned. 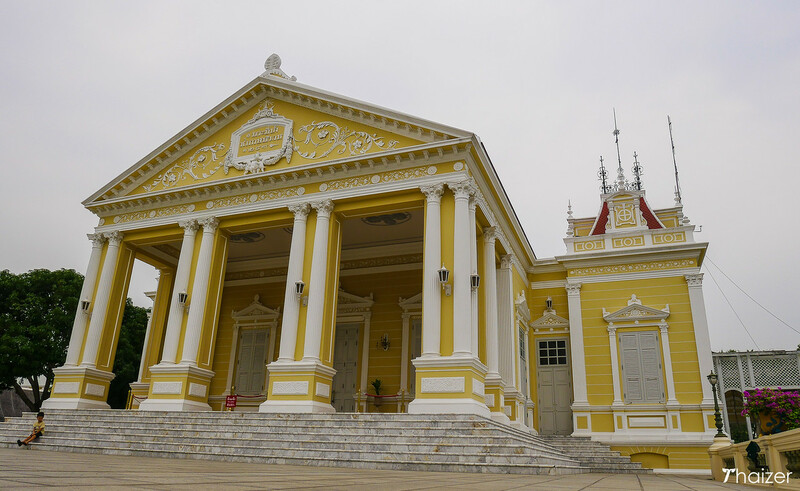 Bang Pa-In was given a new lease of life as a summer palace during the reign of King Mongkut (1851-1868). But it was his son, King Chulalongkorn, who would really establish Bang Pa-In as the palace that can be seen today. Most of the structures at Bang Pa-In were built between 1872-1889. The reign of King Chulalongkorn (1868-1910) was a period of great change for the country then known as Siam. King Chulalongkorn was a modernising monarch who abolished slavery and streamlined the government. Although Siam was a Buddhist country, the king said people should be free to practise other religions too without fear of persecution. It was also during his reign that Thailand’s first railway was constructed between Bangkok and Ayutthaya. With his international outlook, King Chulalongkorn introduced the Western calendar and was also the first Thai monarch to visit Europe. 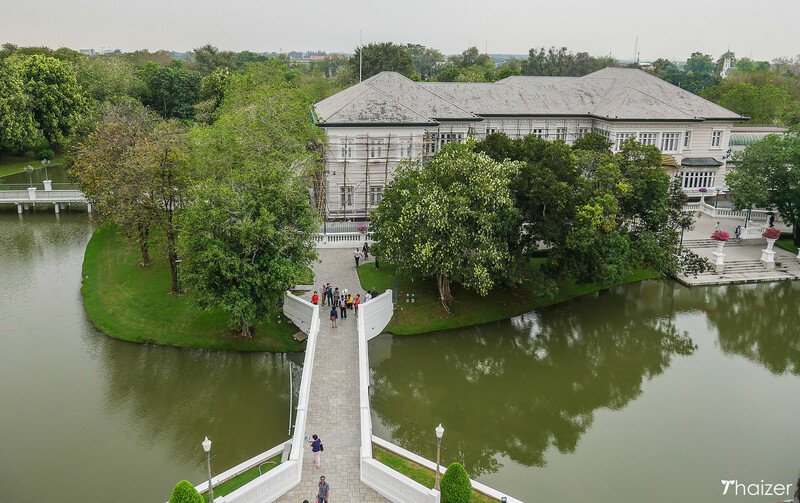 The royal Dusit area of Bangkok was inspired by the boulevards and royal palaces he’d seen on his trips to Europe and this fondness for European style was continued at Bang Pa-In Palace. He died a century ago, but King Chulalongkorn is still revered by Thai people today. The date of his death, October 23, is a public holiday in Thailand and his portrait can often be seen on display inside homes and business premises. 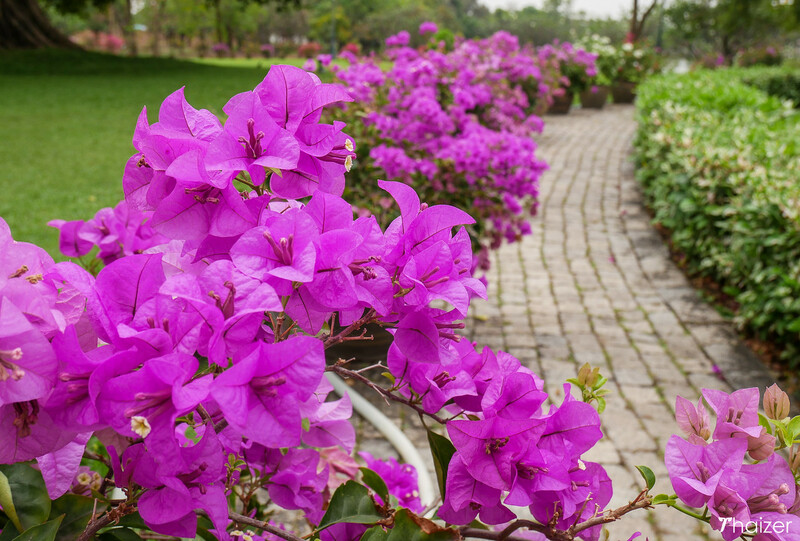 King Chulalongkorn was a keen gardener and was said to have enjoyed spending time in the landscaped grounds of the palace compound. 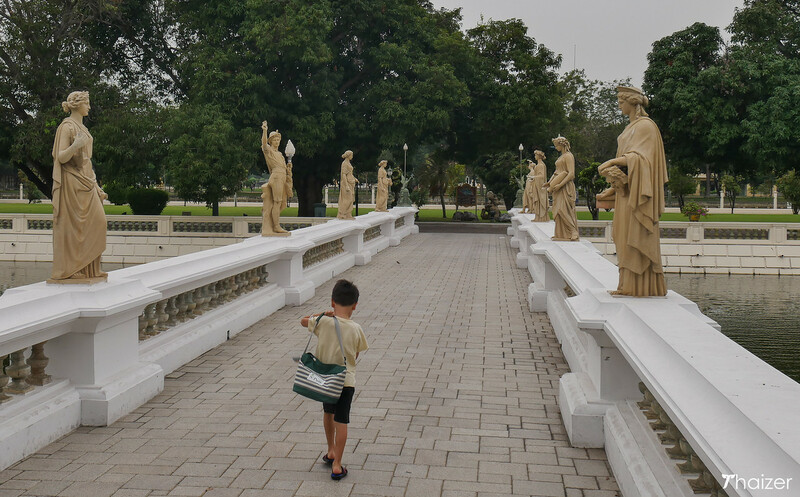 Whether you are interested in the history of the palace or not, Bang Pa-In is an enjoyable location to visit with lakes, water features and a wide variety of plants. 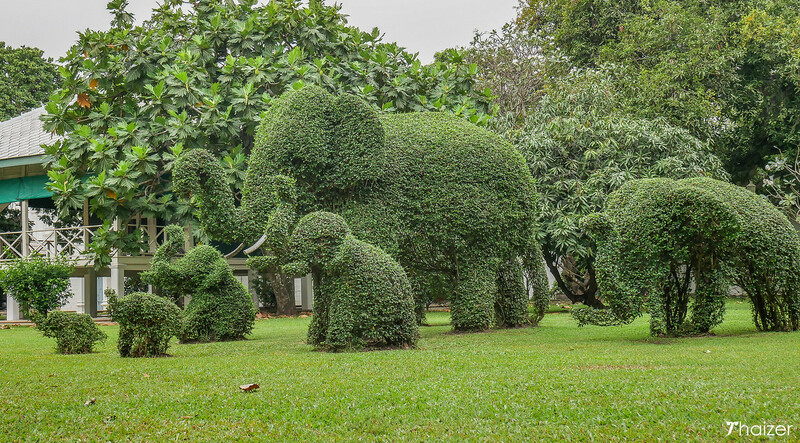 The Thai tradition of topiary or ‘mai dut‘ is also on display here with elephants, peacocks and cockerels standing proudly on the neatly cut lawns. 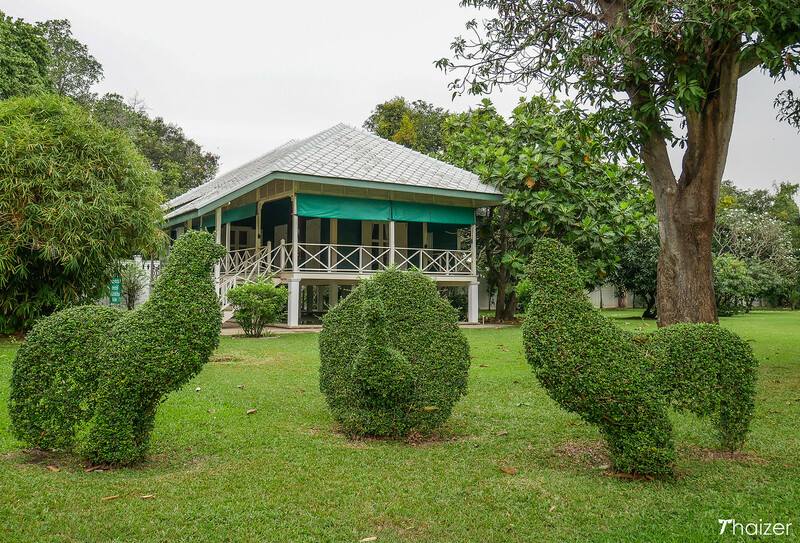 Known in Thai as ‘Phra Thinang Uthayan Phumisathian’ the name of this mansion house translates as the ‘Garden of the Secured Land’ and was King Chulalongkorn’s preferred residence when he came to Ayutthaya. The original wooden structure was built in 1877, but was destroyed by fire in 1938 and was subsequently rebuilt during the reign of King Rama IX. King Chulalongkorn built the Ho Withun Thasana observatory in 1881 and visitors are free to climb the stairs and enjoy the views from the top. Please take notice of the sign that requests visitors to take off their shoes before climbing the wooden staircase. 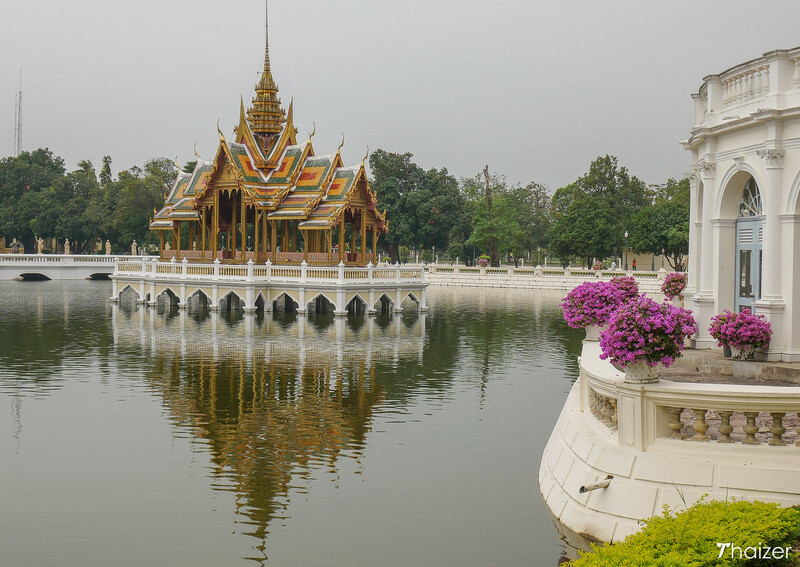 The ornate Thai pavilion that sits in the middle of a pond now houses a bronze statue of King Chulalongkorn. The pavilion, known as Aisawan Thiphya-art, was modelled on a similar building that can be seen at the Grand Palace in Bangkok. 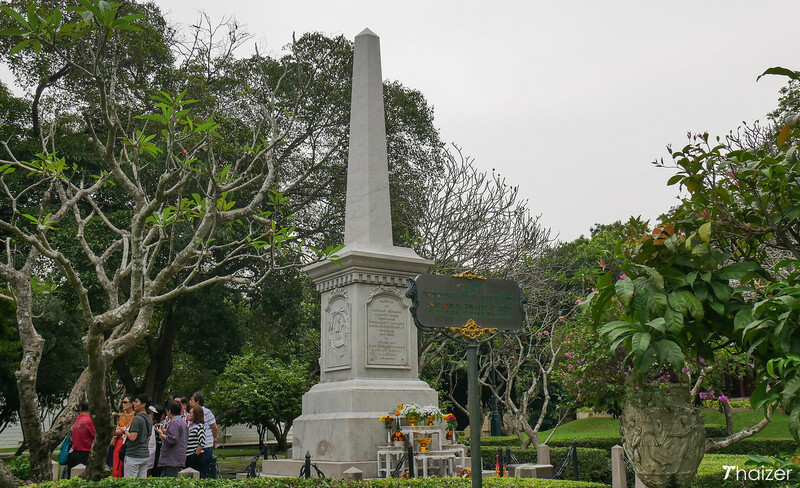 Two marble obelisks stand side by side on the eastern side of the grounds. Both were built by King Chulalongkorn to commemorate the loss of loved ones and have dedications in Thai and English. One is in honour of Princess Saovabhark, a consort of the king, who died along with three of their children in 1887. The other memorial commemorates a tragedy that took place in 1880 and claimed the lives of the king’s first wife and their infant daughter. Up until the 1930s, polygamy was the cultural norm in Siam and it wasn’t unusual for men of high social status to have a number of wives and concubines. In 1880, a royal barge made a fateful journey from Bangkok. The boat was bound for Bang Pa-In Palace but would never reach its destination. On board the boat was the first wife of King Chulalongkorn and their young daughter. Queen Sunanda was just 19 years old and expecting another baby. Her daughter, Princess Kannabhorn, was not yet 2 years old. The boat ran into difficulty and capsized on the Chao Phraya River to the north of Bangkok. Under Siamese law at that time, it was forbidden for any commoner to touch royalty. The penalty for doing so was execution and the same fate could also be applied to all of the immediate family of any person who touched royalty. This law meant that as the barge began to sink, nobody dared to give direct assistance to Queen Sunanda and her young daughter and they both drowned. King Chulalongkorn was devastated by the tragedy and soon after the accident the law was changed to allow commoners to touch royalty if it meant saving a royal life. In addition to the memorial at Bang Pa-In Palace in Ayutthaya, King Chulalongkorn commissioned another memorial in Bangkok. This can be seen at Saranrom Royal Garden which was a favourite place for Queen Sunanda to visit. The palace complex is located in Ayutthaya province, but is approximately 20km (13 miles) south of the main Ayutthaya Historical Park. If you are visiting Ayutthaya as part of a day trip from Bangkok, many tours will also make brief stop at Bang Pa-In Palace. If you are travelling independently, you can take the train from either Bangkok or Ayutthaya to Bang Pa-In. From Ayutthaya the journey takes around 15 minutes on the ordinary train with a fare of only 3 Baht. The palace is a 25-minute walk away from Bang Pa-In train station. It’s also possible to hire a taxi from Bangkok or a tuk-tuk from Ayutthaya. Bang Pa-In Palace isn’t currently used as a royal residence, but there are regulations in place for visitors. Please dress politely. You will not be allowed entry if your clothing is not appropriate. Visitors should cover knees and shoulders and avoid figure-hugging outfits. At the time of writing, some buildings are being renovated and are closed to the public and others are being used for exhibitions. If you travel independently, make time too for the distinctive Wat Niwet Thammaprawat, a Thai temple which is designed to look like a church. 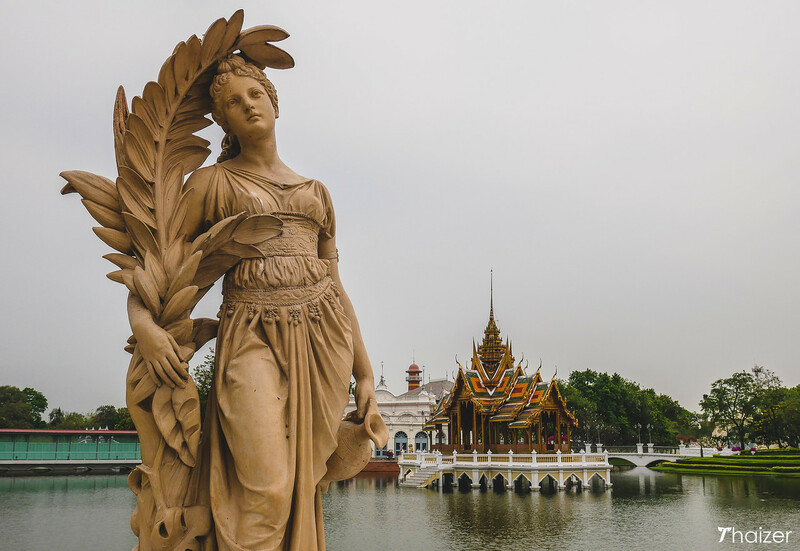 The temple is located across the river from Bang Pa-In Palace and can be accessed by a cable car over the water. 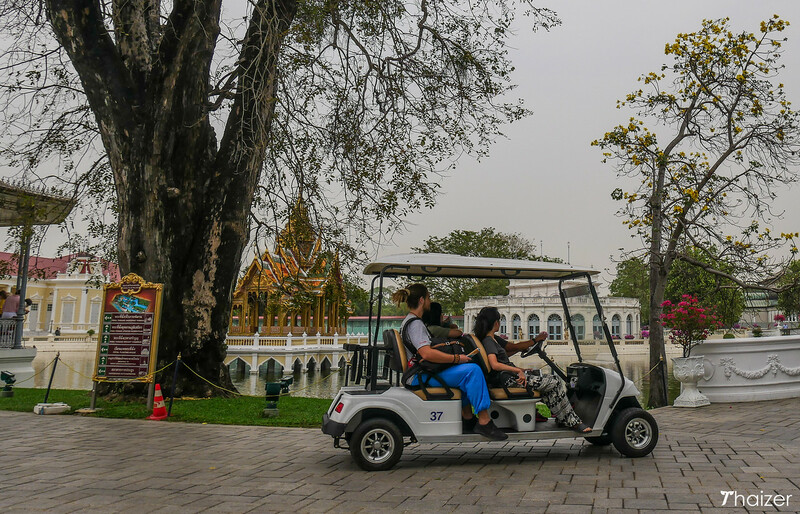 The grounds of Bang Pa-In Palace can be explored on foot or you can hire a golf cart for 400 Baht for the first hour and 100 Baht per hour after that. Carts are limited to a maximum of 4 people and the person driving will need to produce their driving license or leave a deposit of 2,000 Baht.